Although digital advertising has pushed ahead and evolved in ways print media could not, the latter still performs its role as a personalized outlet to deliver messages to a targeted audience. The remaining readership of print media is more dedicated than ever, which is a desirable quality for brands that want to use it as part of their marketing campaign. Whether your goal is to showcase your brand or gain a direct response from leads, print media can effectively share your message with your prospects and readers. Below are some of the best print media templates that have proven successful for a variety of brands. 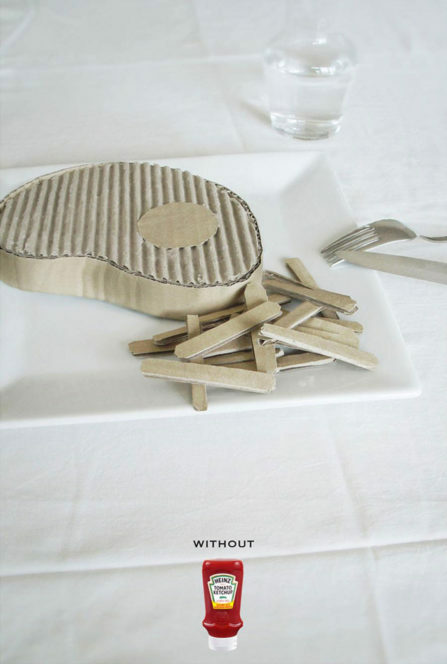 If you’ve ever eaten a meal and said it “tasted like cardboard,” you’ll understand this ad. Heinz Tomato Ketchup uses their print media ad to express just how bland steak and fries would taste without their delicious product. Using cardboard in their ad instead of real steak and fries, really drove the point! 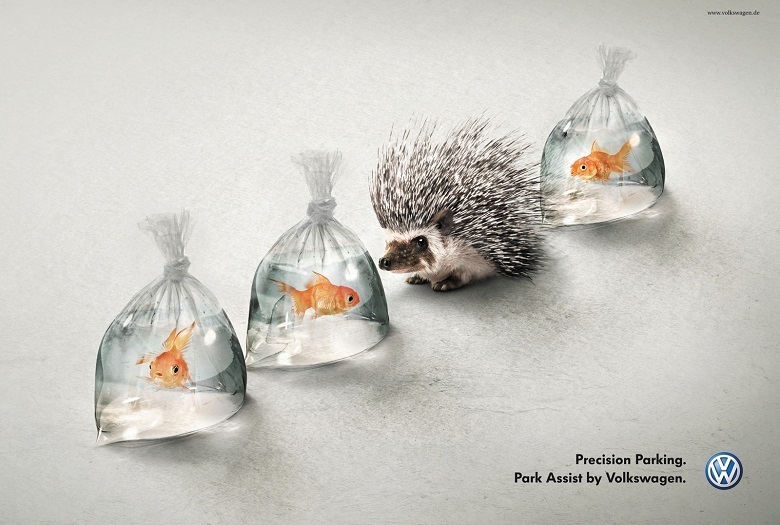 To advertise its Park Assist feature, Volkswagen emphasized just how well it helps drivers park carefully. In its print media ad, the automobile brand showed a spiky porcupine in close line with three bags of goldfish in parallel park formation. Close call! “Be on top of your game, whatever your game,” is the slogan for this brand’s print ad. 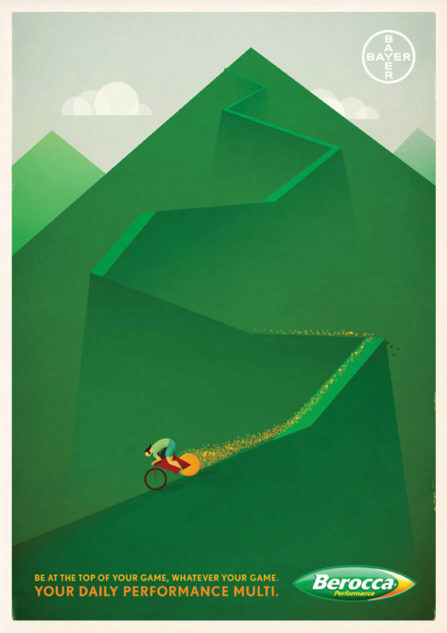 To advertise its daily performance multivitamin, Berocca Performance created an illustration of its multivitamin as the back wheel of a bicycle that a man rides speedily down a mountain pathway. The difference between these two photos is what makes it so effective. In both photos, a child is jumping for joy at something one of his parents is holding in their hand. 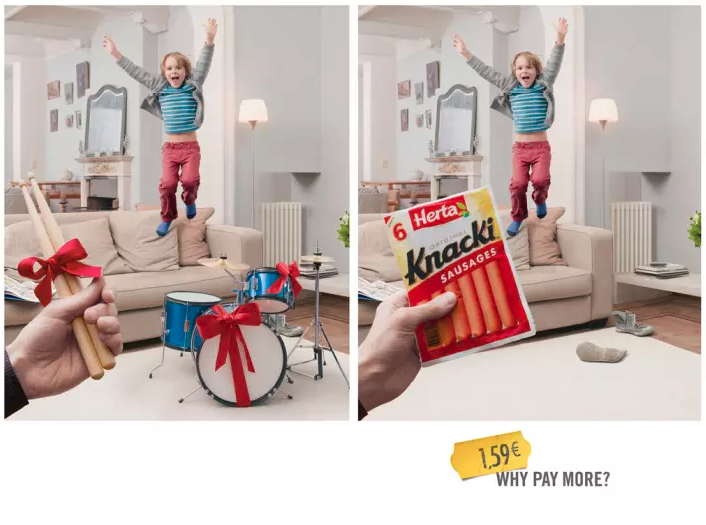 The first photo shows a drum kit as a gift, while the second shows the Herta Knacki sausages. To drive the point home, the brand wrote “why pay more?” to caption the ad, expressing that their sausages will make your kids equally as happy. 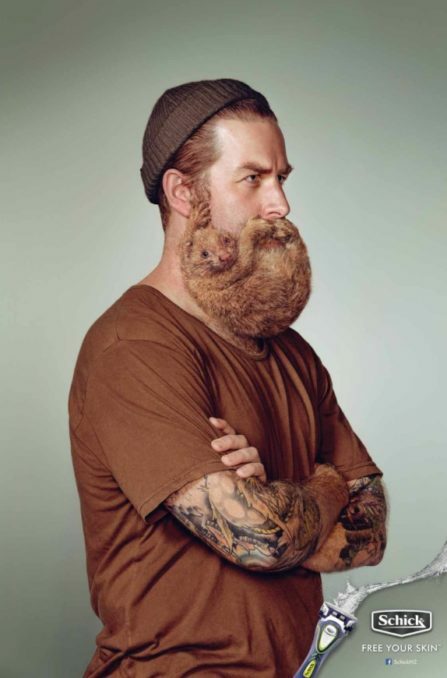 The sight of a fuzzy rodent hugging the model’s face makes the viewer want to shave it right off! Schick created an effective visual ad that promotes its razor to “free your skin” and opt for a clean, fresh face. 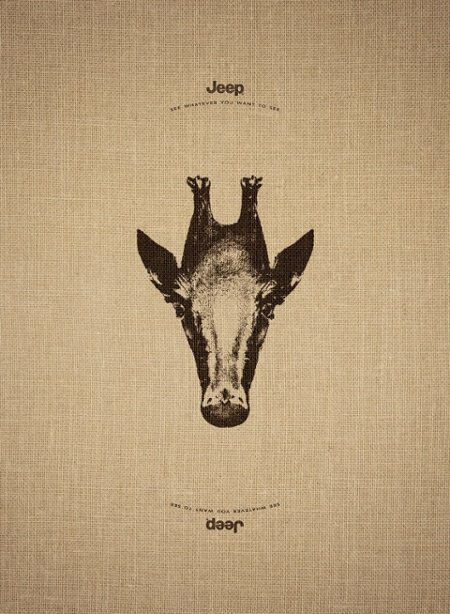 In this creative ad, Jeep advertises its vehicle with an animal illustration that looks like a giraffe in one direction, and a penguin in the other. The visual is so simple it’s almost missed, but that is why magazine and newspapers ads are so powerful—it gives the viewer time to examine and process the message. 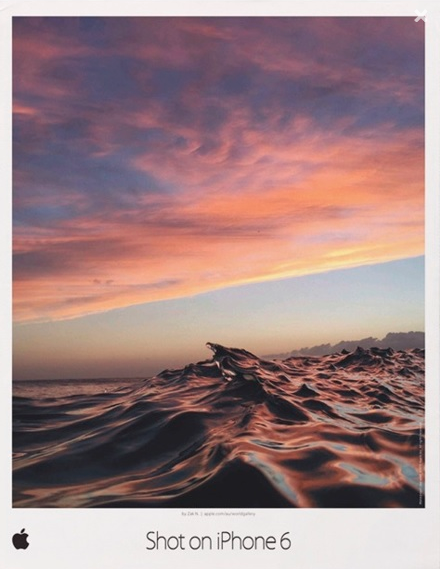 One of the biggest selling points for Apple’s iPhone 6 was its incredible camera. Although the print ad is in the shape of a developed, Polaroid picture, the image itself is stunning in color quality and definition. For years, McDonald’s has had a love-hate relationship with people. Although their food is very tasty and affordable, many health experts have claimed that the ingredients and processing of the food is unhealthy. 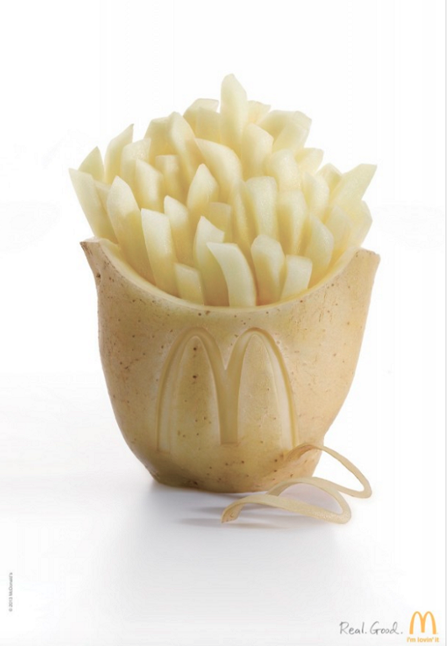 In this creative ad, the food franchise uses a potato skin to replace their red and yellow cardboard fries’ box. The ad illustrates that diners shouldn’t worry about a thing, because their fries are made from real potatoes. Why Are Print Media Ads So Effective? A call to action (CTA) that directs people to contact you, visit your web site, or stop by your physical store. Brand recognition so that your readers will automatically associate your ad with your brand. Usually this includes your logo, brand color scheme, or company slogan. Print is still here and thriving, and there are many ways you can incorporate it into your marketing campaign. You can use it on its own to target your prospects or connect it to your digital campaign to direct prospects to your web site or online store. At Macromark, we specialize in helping our clients create robust, effective, successful print ad campaigns. Our variety of services can be customized to suit your business goals, and we have packages that can work with a range of budgets. Whether you are a small company, or a large one, we can help you target your audience, retain customers, and build your reputation among your audience as a company they can trust. If you need help catching the eyes of your readers and establishing an effective advertising campaign, consider working with our print advertising agency. If you want to experience the advantages of a successful print media strategy, seek direction from the our experts. We can help you set up a successful print advertisement campaign, with all the all the information assistance you need to get it up and running. Our services also include print media, direct mail marketing, list brokerage, data solutions, list fulfillment, and list management. For more information about how we can help grow your business, contact us at 1-(845)-230-6300.